Stay warm all year long with one of our awareness throw blankets! This hope throw will give your friends and family members who might be going through a difficult time the hope that they need to get through. Pick your awareness ribbon color and customize your very own blanket. Great as Cancer or Multiple Sclerosis Gift Ideas for a walk or fund-raiser. 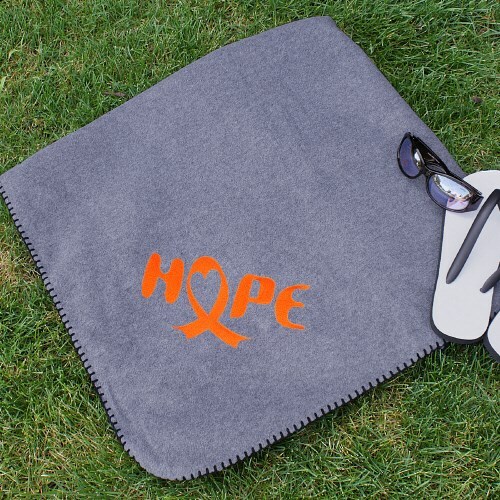 Your Embroidered Hope Fleece Blanket is a 100% polyester, 6.5 ounce fleece blanket. Tone-on-tone decorative whipstitch around the outside of the blanket. Size: 50" x 60". Fleece blankets are available in Charcoal, Red, Maroon, Forest, Royal and Black. Embroidery thread colors are available in White, Black, Pink, Sky Blue, Lavender, Burgundy, Red, Emerald Green, Lime Green, Yellow, Brown and Khaki. Choose your color blanket and favorite thread color to truly make this blanket a one of a kind keepsake. Additional Info You can give the gift of hope and comfort with one of our awareness gifts. This throw blanket will keep your friends and family members warm while giving them the strength and courage they need to get through the tough battle that they're facing. They'll appreciate your support!